If you've been a regular reader of my blog you're bound to already know how important the topic of mental health is to me. As a licensed clinical social worker, it's a given that this topic is not just a part of my professional world - but basically IS my professional world. And when it comes to personal discussions, you already know that I speak freely about how important it is to take care of your mental health. 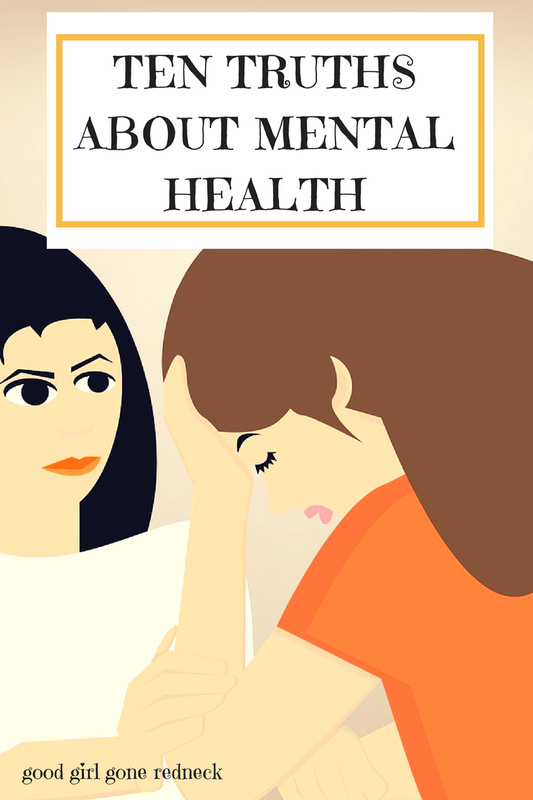 For mental health awareness month, I'm participating in an effort with some other bloggers, coordinated by Brittany of Clumps of Mascara, to normalize the discussion about mental health. And in doing so I've decided to share some truths about mental health - for those who might know nothing about what it's like to get help - or what it's like to struggle with mental illness - or - well - pretty much anything I can share I'm going to share here. Because for those out there struggling, it's helpful to hear these things (or read them, as the case may be here), and for those who aren't? It's important to those who are that YOU read them, too. And hear them. And know what your friends and loved ones are experiencing. So please - even if this doesn't apply to you - read on. You just might be able to better understand someone in your life who needs you to. 1. You are not crazy. If you are struggling with mental illness this does not mean you are crazy. Crazy is such an interesting word. It's taken on some awful connotations and come to mean 'not mentally sound'. Which is a simple and straightforward definition, but also,when exaggerated, comes to represent someone who is mentally deranged. This is not you. You may have anxiety, you may be living through depression, you may find that you're crying all the time. Admitting that there is something wrong with you does not label you as crazy. 2. You're not the only one. Please, trust me on this one. Part of the reason I speak and write about mental health so frequently is because of this important reminder. Everyone who goes through these things, these emotions, these worries and heavy thoughts feels like they're the ONLY one. It's not true. It's not even remotely true. You're not the only one. 3. Medication is not evil. You don't have to want to take medication to help you manage whatever it is you're experiencing. Nope. Not at all. But do not judge someone who does. Please. Don't. Mental illness often occurs because of a chemical imbalance in the brain, and medications often help create a balance that levels out the anxiety and mood disorders many experience. Medication helps MANY people every single day. Whether it is what works for you or isn't can only be your choice and something you discuss and assess with your doctor(s). But for those out there who do take medication it is often a lifesaver in many ways. It is not evil. 4. Medication is not for everyone. Yes. I know. I know what I just said. But some people do not think that medications are what they need to get themselves on a different track. And some people are against taking medications and prefer other methods of health management. Don't judge these people, either. Basically, don't judge. That should have been the first thing on this list. If someone asks you your thoughts on medications, you can answer them one way or the other even without knowing what they think. Tell them your truths and allow them to find their own. It is. I know how that sounds. And I know, I AM a therapist, so that's something I'm saying from the perspective of how important it can be for clients. But I'm also someone who has been through therapy, and could surely benefit from it again at some point. I'm a big advocate of therapy and think everyone should consider it. I think that speaking with someone who is removed from your personal situations and finding that person is an incredible listener and able to do so without judgment is something everyone needs in their life - at least once. Whatever you're going through? A therapist can help you process it and help you find your way. 6. Not every therapist is your perfect match. You know how when you were dating or if you are dating or making friends you connected with people and knew pretty much right away if they were or weren't your people? Same goes for a therapist. If you meet with someone and simply find that they're just not the right fit, or you meet with someone and have that gnawing feeling? It's okay. You don't have to go back. Yes. You will have to start over and tell someone else the things you shared with therapist number one. But hey, you need to find the one that's right for you. Don't allow yourself to be stuck with someone who isn't listening and isn't hearing you - or seems to be leading you in a direction you're uncomfortable with. Therapists are people, too. And not every one matches with every perspective client. 7. Not every diagnosis fits its stereotype. You might think you have OCD. Do you even know what OCD stands for [obsessive compulsive disorder]? Or have you heard that it's just when someone does the things that you do? It can mean that. It can also mean so much more. Or so much less. Labeling yourself as OCD doesn't do anything for anyone - least of all you. If you're exhibiting symptoms of any diagnosis, don't self-diagnose. Please. If you've just had a baby and you're experiencing things that you think look and sound like PPD? Talk to your doctor or the baby's pediatrician. Ask for help. Direction. Assessment. You could be experiencing similar things to what every new mom goes through. But you also might not be. Not every new mom wants to run and hide when the baby cries. Not every new mom is afraid of hurting her baby. Not every person experiencing depression wants to stay in bed all day every day. Some sufferers go to work same as you. Cook dinner every day same as you. And support their family the same as you do. But they're struggling. You could be, too. 8. It can be scary. It can be scary to experience all the things you're experiencing. All of the emotions. The things you're feeling. The things that trigger you. They're all terrifying at points. But you're entitled to feel all of these feelings. Entitled to be afraid. Just know you can also get help. There are people around you - out there and nearby - who are open to talking and listening and there for you when you're most scared. So. Be afraid. Feel scared. But remember that's absolutely normal. 9. Men experience mental illness, too. All of these things I've mentioned? They're not just for women. And they're not just for moms. Men experience mental illness, too. And these things you're experiencing? They do not make you weak. They do not place you into a specific box or shove you under a certain label. You are no less a man because of your mental health issues. You, too, need and should permit yourself help. Find support. Talk to someone. Tell a friend or family member what you're going through. Talk to your doctor if you're worried about telling someone close to you. Reach out and get professional help. You deserve to take care of you. Always. No matter how alone you feel - how alone you think you are? You're not alone. Remember that if you need someone to talk to and are struggling you can reach out. Call the National Suicide Prevention Lifeline at 800-273-8255. You do not have to be contemplating suicide or considering hurting yourself to reach out to them. Call them if you need to talk. Call them if things are too overwhelming and you don't know what is going to happen next. Call them if you're terrified and alone. Just call them. Please. Reach out to a loved one. Don't go through this alone. You're not alone. People are out there, ready to listen. People who love you. People who care. Please make the call. Please do not hesitate to reach out and email me if you need more resources or would like to find an organization in your area for support and/or to volunteer with. That said, if you are in the midst of an emergency, please, PLEASE, I cannot stress this enough - call 9-1-1. I like how you laid this out. When I was growing up, the term "mentally ill" was like eye color or gender, something you had forever. The perception was also that mentally ill people were outwardly so. Therefore if you weren't walking around town in your underwear you were probably fine. How grateful I am that when our children were growing up, "mental illness" was seen more as an injury and not a defect and therapy had become a more accepted intervention. The stigma is not changing fast enough, but it is changing still. Thank you for the warm and encouraging words about this. Thank you so much for participating! #10 is my favorite truth because I think it's so important for people to know that they aren't alone.